The Gardman Single Shepherd Hook complements every backyard garden or bird habitat with its classic beauty and quality design. From hanging wind chimes and flowering baskets to tube feeders and lanterns, this single hook helps you achieve both bird feeding success and backyard beautification. The hook beautifully displays hopper, platform, and tube feeders as well as hanging plants, outdoor lanterns, and other decorative objects. The convenient "step-in" base provides a strong 10.75" anchor for the entire hook. 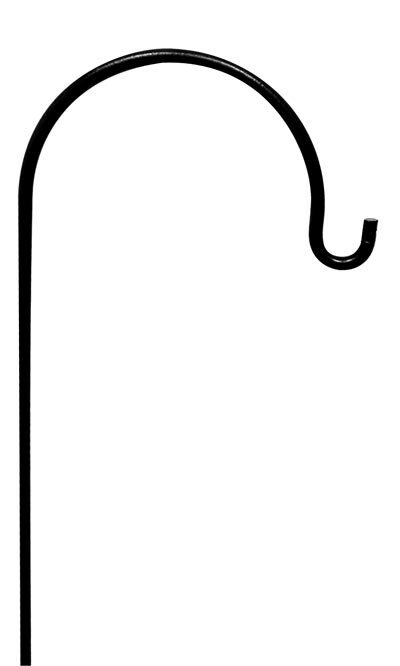 For long-lasting durability and beauty, this hook is made of steel and has a weather resistant black coating. Enjoy a beautiful backyard for years with the Single Shepherd Hook.